Herb Thompson at ASPM in Vandalia. A few months ago Herb Thompson was homeless. Now he has a fully furnished apartment and a new outlook. He’s also accepted a promotion. “What more can you ask for?” he says with a smile. Born and raised on a Preble County farm, Thompson moved to Dayton at 18 and immediately found work in manufacturing. “At 19 years old I was firing up million dollar equipment,” he recently told us. He enlisted in the Navy worked as a technician for six years. Specifically, he specialized in electronic surveillance on submarines. When he returned to Dayton in the late 1990s, he learned that manufacturing had “fallen off completely.” So he worked for Auto Zone. And Time Warner Cable. For a while he operated a tow truck. It became increasingly hard to find steady work. A tough job market mixed with a bad break or two led to homelessness. Eventually the military veteran linked up with Volunteers of America. They referred him to BarryStaff. 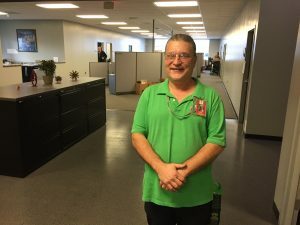 Within a week of interviewing with Barry, he was working at the ASPM plant in Vandalia. Even then, he wasn’t super optimistic to begin working as a machine operator. Nevermind the repetitiveness, he was told. Work hard and you’ll quickly advance. He took the advice and used the foot in the door to his advantage. He rolled up his sleeves and hunkered down. Within weeks, he could keep up with workers half his age. Thompson’s confidence grew. The promotion quickly followed. He’s now working as a material handler, which comes with more responsibilities. Does he look back? Yes and no. Then Thompson, who has a way with words, quickly sizes up his journey. Click here to hear Herb Thompson’s story in his own words.